A happy discovery in my genealogical research was the online availability of deeds for the state of Maine. The Maine Registers of Deeds Association provides links to each Maine county website. Users can download up to 500 pages per calendar year for free. As Lindsay Fulton wrote in her April post 8 More Vital Record Alternatives, deeds are often an acceptable source for proving specific relationships between family members. And if you haven’t gone hog wild and used up your quota already, you can stay in during this snowy end of the year downloading just about every mention of your Maine ancestors in these deeds. 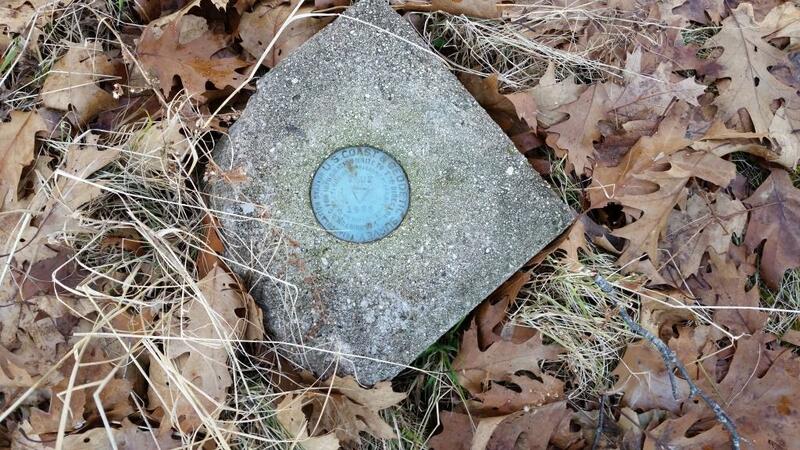 The site for Cumberland County is a particularly rich example of this resource’s offerings. 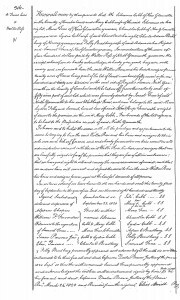 While other counties may only have a few decades of digitized deeds, Cumberland County has put up online records from 1753 to December 2015! Furthermore, it is especially valuable for Cumberland County researchers, as probate records for this area before the 1908 fire in Portland are (ahem) toast. Deeds for this county are currently not online at FamilySearch nor are they available on microfilm at NEHGS. My Maine roots stem from my maternal grandfather’s family, who settled up and down the eastern side of the state, particularly in Cumberland County. My branch of Trues spread out from Salisbury, Massachusetts, when Israel True settled in North Yarmouth. These Trues were very good about being documented in town, vital, and census records, consistently spelling their name for anyone who might try to call them “Drew,” “Tru,” or revert to “Trew” – something I still have to do today! Any event in their lives is pretty easy for later generations to find – except for the birth of Israel’s grandson, Moses. 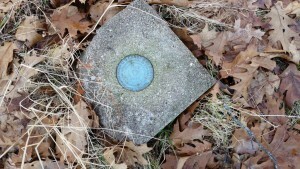 Our families’ names are tied to the land we lived on, as with this marker. Moses was born sometime in 1790, most likely in North Yarmouth. Though his lineage was richly detailed in Cumberland County biographies of two of his eight sons, I had trouble finding solid sources connecting Moses to his father Winthrop, who died when Moses was 12. Traditional avenues didn’t pan out. 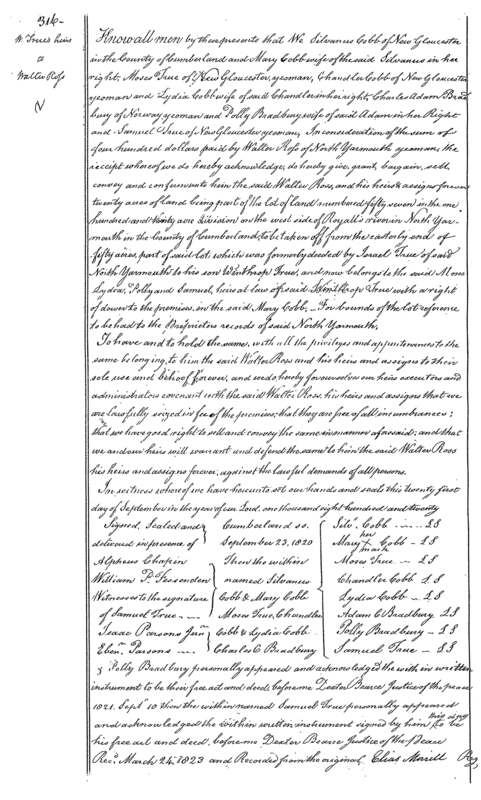 But, then, I searched for Moses True in Cumberland County deeds and found a deed filed in 1823, which listed Moses and his siblings not only as children of Winthrop but as grandchildren of Israel. Three generations in one deed! Five hundred pages is a lot to download before 2016, but if it’s not enough, your count (for that account anyway) resets in the new year. After that, it’s 50 cents per image. It could be a very productive way to spend the end of the year. An alternative to downloading deeds is easy and free: copy the online original using Grab or any similar photo app on your computer. Do othe New England states have a group making deeds available? Deeds! Some of my favorite paperwork. I am quivering with excitement (this is a condition I’ve developed only since becoming so deeply involved in genealogy). I recently started work on some lines that, in theory, originated in Mass and then went directly west, but instead somehow removed themselves to Maine on the way, for at least two generations. Too late for this year, but next year starts tomorrow, so I’m good. I can hardly wait to id enough on these lines to know which counties to look in. Ellen, thanks for the hint. I have used that technique sometimes for photos and some documents (esp.census sheets). Glad you reminded me so I don’t have to relearn that one again! Looks like you have to register and provide a credit card information to search.